By having the correct poultry lighting system chicks can easily locate their food and water, resulting to positive feed conversion over time. Stotts have years of experience working with lighting and have found that poultry farms in Australia benefit from a light intensity control system for compact fluorescent lamps in blue and green 11W CFL’s. The Eltam’s ‘Orion Poultry Lighting System’ is a modern agriculture lighting system that comes equipped with bright green and blue lights specifically designed for poultry production. Through this lighting system, poultry owners or broiler breeders can control the light in the broiler house according to the appropriate lighting for the broilers which is from 100% down to 20% (25 Lux to 5 Lux). It has been known that by having the correct poultry lighting system, chicks can easily locate their food and water, resulting to positive feed conversion over time. Maintaining a green and blue (20-30 Lux) surrounding also improves chick activities. After a week or two, breeders can gradually reduce the level of lights down to 5 Lux in dark areas to relax the broilers, reduce their activities and reach their desired weight and liveability. 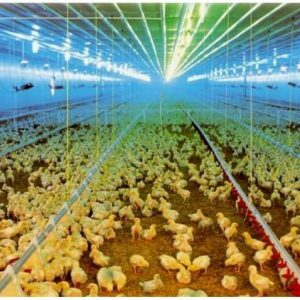 Green and blue lights have also shown to stimulate growth both at an early age and later stage as well as to boost poultry production. Maintain a green and blue light of 20-30 Lux at bird head level for the first 12 days. Shut off the green light after 12 days and lit 2 rows of blue light on high dimmer position in the broiler house. After 14 days, the 2 rows of blue light should be reduced to the medium level for 2 days. After 16 days until the end of the flock growth, the broiler house should be lit with 2 rows of blue 11-watt lamps on low dimmer position.